Finding a hotel or resort in Aruba is easy: nearly all are located on the island's northwest coast along a roughly 10-mile stretch of beachfront between the capital city of Oranjestad and Palm Beach, the most densely developed tourist area on the island. 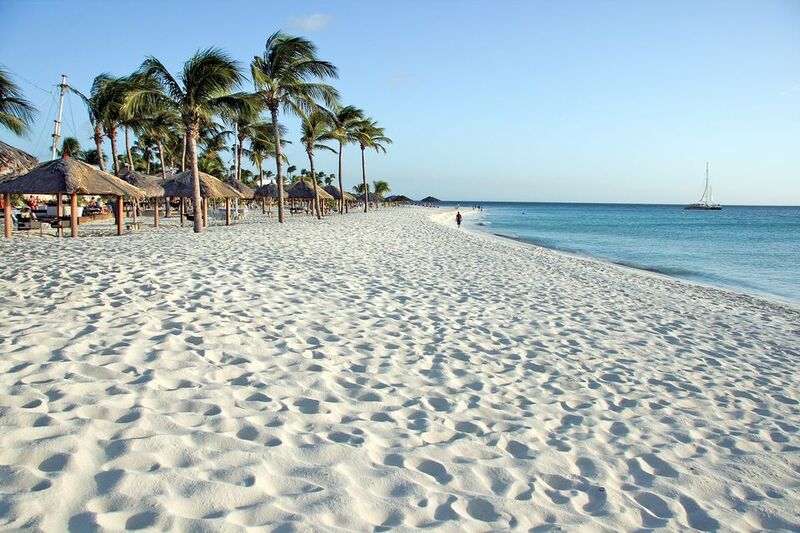 Although Aruba has major resort districts, there are many diverse places you can stay when visiting. As you might guess, Palm Beach is home to most of Aruba's largest resorts, including multi-story properties with hundreds of rooms each operated under familiar names like Marriott, Hyatt Regency, Hilton, Riu (all-inclusive), and Holiday Inn. If you're looking for a resort where you can find multiple restaurants, shopping, and activities within easy walking distance, this is your best choice. Most of the big hotels have casinos, and many of their restaurants represent the best of the island's dining choices. Water-sports vendors line Palm Beach, so you're never too far from a snorkeling, diving, windsurfing, or other adventures on the calm waters of the Caribbean Sea. Across the street from the high-rise resorts is the Paseo Herencia shopping center, which has a number of small specialty shops, restaurants, nightclubs, and an excellent multiplex cinema. The downside? Palm Beach can often be quite crowded, especially in high season, and there's a constant bustle of activity with boats coming in and out of the docks. This is not the destination for you if you're looking for seclusion or privacy. Palm Beach also is the furthest district from the airport and Oranjestad (though still only a 20-minute cab ride), and you may find more tourist traps than authentic Aruba culture here. Far more laid-back than Palm Beach, Aruba's low-rise hotel district sits just north of Oranjestad and offers accommodations in one- and two-story beachfront rooms and villas. This area is dominated by a brace of Divi-branded resorts, all-inclusive properties with lots of timeshare owners and repeat guests, making for a cozy and intimate experience. A more upscale neighbor is the Bucuti Beach Resort, which offers four-star, couples-only beachfront suites. If you're looking for a quiet stretch of sand to (mostly) call you own, you can't beat the quiet low-rise district. Oranjestad is also a quick bus or cab ride away (you can even walk it), and a cluster of nearby supermarkets make life easy for those with efficiency rooms. Off-resort fine dining and most activities will require a drive, however. There's really only one big tourist hotel in downtown Oranjestad, but it's a good one: The Renaissance Aruba Resort and Casino. There's actually two properties: the Marina Hotel, located right on the capital's busy main street, and the Ocean Suites, which are on the downtown waterfront. From either property, you can walk to multiple restaurants, casinos, and attractions like Fort Zoutman and the Atlantis submarine excursion. If you like to shop, the Renaissance is the perfect property for you, in close reach of dozens of jewelry stores and other specialty shops. Best of all, if you tire of the urban environment you can hop on the hotel's water taxi for an escape to the private Renaissance Island, which has quiet beaches, tennis, spa services, and resident wildlife like flamingos and iguanas. Some of Aruba's smaller hotels are located at Eagle Beach between the low-rise and high-rise hotel districts. Properties like the Costa Linda Beach Resort and the Amsterdam Manor Beach Resort are located across the street from the beach, and there also are some shops and restaurants within strolling distance. Eagle Beach itself is a nice compromise between sandy solitude and ocean activities, with an uncrowded atmosphere but also home to the island's jet ski operations, banana boats, and more.